Olympus handheld X-ray fluorescence (XRF) analyzers provide exploration geologists rapid field assay data of drill cuttings and diamond core for 35 elements simultaneously (Mg to U). Recent major advances in handheld XRF technology have vastly improved the limits of detection, number of elements measured, and greatly reduced test times. Olympus handheld XRF analyzers are currently used in a wide variety of ways on exploration drill samples. The perfect samples for XRF analysis are dry, fine-grained, homogenous samples similar to the pulped powder analyzed at the lab. However, informative, “fit for purpose” geochemical data can be collected in the field using XRF on samples that are not completely dry and homogenous. Due to the nature of Reverse Circulation (RC) and Rotary Air Blast (RAB) drilling, the samples generated are already partly homogenized. Thousands of handheld XRF analyzers have been used on samples from these types of rigs to better inform exploration managers of drill hole geochemistry during the drill program. Any analytical error associated with testing non-homogenous samples is generally outweighed by the value of semiquantitative geochemical data generated very quickly by handheld XRF analyzers and the time and cost savings this brings to exploration projects. The drill logs below demonstrate an exploration drilling project of Rimfire Exploration in Australia. The logs demonstrate Au lab assay data and elevated concentrations of Au and pathfinders Ag, Pb, and As identified by the XRF analyzers within the interval found to contain elevated Au. 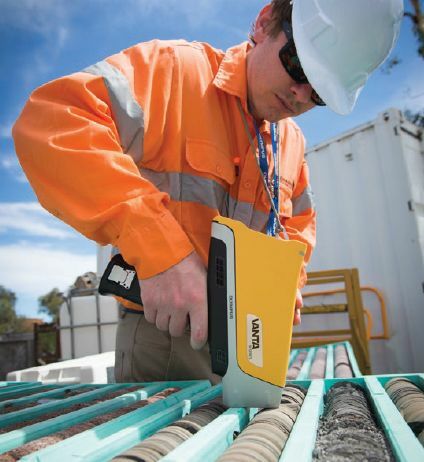 VantaTM handheld X-ray fluorescence (XRF) analyzers provide convenient, easy, on-the-spot measurements of drill cuttings and core to obtain fast field geochemistry results. Use of handheld XRF analyzers for exploration drilling can provide a rapid return on investment for certain projects. This translates into direct cost savings to shareholders very quickly. On their projects in the Northern Territory, Australia, Managing Director Darren Holden estimated cost savings of $900,000 AUD in one year directly attributed to using two Olympus XRF analyzers. Savings were made using XRF as a screening tool on RC chips to help select the most important samples for more expensive laboratory analysis. Effective use on freshly drilled or cut diamond core is one of the most difficult applications for XRF due to the veiny and spotty (non-homogenous) nature of geological samples. Nonetheless, methodologies are routinely established to gather XRF data from numerous points per meter of core to assist geologists in selecting samples for lab analysis and to provide supplementary and immediate geochemical data during core logging. This is generally a qualitative/ semi-quantitative use of XRF to identify trends within the geological system. In the three graphs opposite from a Cu exploration project in the Iberian Pyrite Belt, XRF readings were taken every 10 cm and averaged over each meter and compared with lab data. Trends can clearly be seen suggesting samples 1–5 and 10–13 be selected for lab analysis. It can be argued that it is unnecessary to send samples 6–9 to the laboratory, potentially saving 30% of your lab costs within this sample subset. This is an example of an actual orientation survey on a customer project.